Two Admiralty pattern long shanked anchors from the sail training ship Vernon, built 1839, serve as a Sydney-based memorial to Merchant Seamen who died in service or were killed in action in World War Two. Perhaps the largest of their type on public display in Australia, the anchors weigh over four and a half tons each. The anchors were recovered from shallow water off Goat Island and set up as a memorial in 1992 with the assistance of BHP. 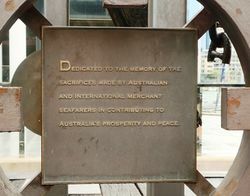 A plaque on the monument also commemorates the sacrifices made by Australian and international merchant seaman in the development of Australia. In memory of all Merchant Navy seafarers who made the ultimate sacrifice during World War II (one in eight Australian merchant seamen gave his life), and in recognition of the sterling wartime contribution of seamen`s women`s auxiliaries. Dedicated to the memory of the sacrifices made by Australian and international merchant seafarers in contributing to Australia's prosperity and peace.